Photography is just like every other skill — it requires three things: 1) a basic understanding of the fundamentals, 2) lots of practice, and 3) some raw talent (and maybe a little luck). Books won’t help you much with the last two, but they’re perfect for the first one. Photo Nuts and Bolts: Know Your Camera and Take Better Photos is a book that focuses on the fundamental theories and mechanics of the camera. So this goes way back to the very nature of light and the tools we use to capture it. Aimed at the beginner to intermediate dSLR user, the book steps through the foundations of modern photography. Understanding your camera and the light it captures is the basis of solid photography and is essential to more advanced topics. 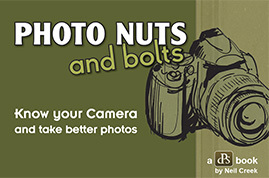 You can purchase Photo Nuts and Bolts from digital Photography School. Links in this post are affiliate links to the product — It doesn’t cost you anything extra, but I get a cut of the sale. Photo Nuts and Bolts is a 64 page downloadable eBook containing 10 lessons in the fundamental theories and mechanics of photography. The three column layout and minimalistic formatting make this book easy on the eyes and a pleasure to read. Supporting photos and diagrams are scattered throughout as needed, but are not overbearing in their presence. Each lesson is approximately three to four pages long, making them a moderately quick read. The 10 lessons in this book are very concise and to the point (I’m particularly impressed because I’m a rambler). The material is presented as introductory reading for the given topic. While it does go into details, it will leave the reader with a basic understanding and a thirst for more. 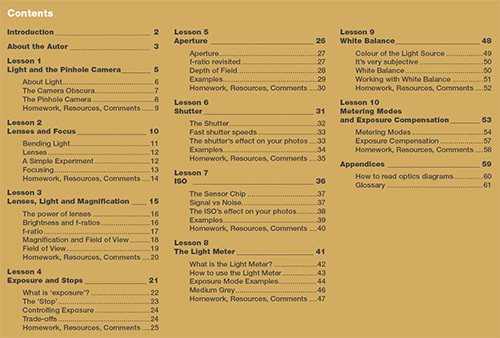 The last page of each lesson helps quench that thirst with homework challenges, additional resources to various websites and web articles, and questions/answers and comments from fellow photographers on the given topic. The flow of the book is fairly important, and I would suggest reading the lessons in order since they build on each other. We start off with a few lessons in light and optics, followed by exposure controls, and finishing up with additional camera controls. The end of the book also has a glossary of the basic terms used throughout the book. As a bonus for the launch of the book (1 week only), you’ll receive a one page pocket guide intended to print out, fold up, and… stick in your pocket. This little guide gives you some general camera settings that may be useful for 10 different situations (outdoor sunshine, outdoor dusk, indoor action, indoor low-light, etc.). Neil Creek is a fellow photography enthusiast that decided to take a shot at the professional side of things a few years ago. 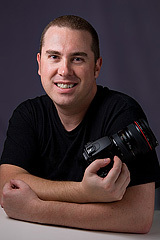 He’s been doing well photographing, teaching courses, and writing for the digital Photography School. I’ve known Neil for some years now, and his enthusiasm for the art of photography has only grown each day. 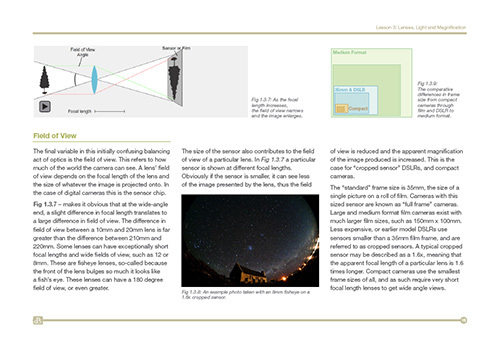 The writing in this eBook reflects his high level of understanding in the technical and mechanical/optical aspects of photography. This is a good solid book that teaches the foundations of photography in a concise and meaningful fashion. And even if you’re somewhat familiar with the topics, there are a lot of background and theory details presented that you don’t typically see outside of textbooks. Readers of the digital Photography School blog will notice that many of the lessons in the book have been published in the past months. So why buy the book? A lot of stuff has been reworked and touched up in these articles. Plus, the last two chapters are completely new. It’s also handy to have everything in consecutive order and in one package so you can quickly reference the topics at any time. I would suggest this book for beginner/intermediate photographers wanting to gain a better understanding of their equipment (the dSLR in particular). If you’re struggling with concepts like exposure controls, lens controls, light metering, white balance, and other fundamentals, this book should straighten you out. You can purchase Photo Nuts and Bolts for $19.97 just for this first week for an undetermined time period, after which point it will return to the regular price of $29. Plus, the pocket guide is only available for the first week purchases, so grab it soon! This entry was posted in Features, Reviews and tagged book, ebook, fundamentals, knowledge, learn, photography, photography book, resource, review, teach on January 21, 2010 by Brian Auer. Just downloaded this course. Can’t wait to get started this weekend.